...den Präsidentschaftswahlen in USA hat dieses Mal am 6. 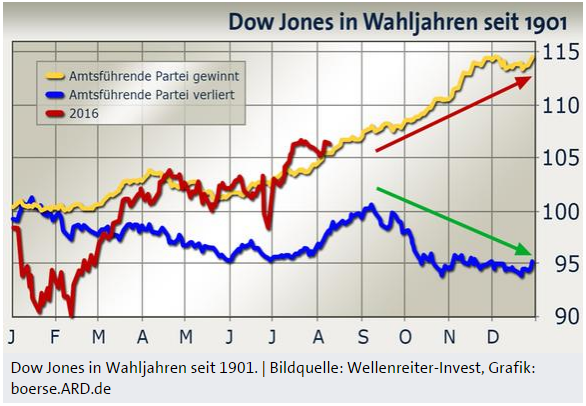 November stattgefunden) sind die Kurse beim Dow Jones zwischen dem 1. November und dem 31. März des Folgejahres seit dem Jahr 1942 (!) nur ein einziges Mal (2002/03 mit Minus 4,8 %) gefallen. ...sectors in the final two months of the year, the S&P Industrials sector leads, gaining 4.6 %, a positive trade 83 % of the time. The Materials and Consumer Discretionary sectors log gains of nearly 4 % each, trading positively better than 70 % of the time. From a closing-level of ca. 2,900 points in the broad US-Stock Market Index S&P 500 a rise of ca. 4.75% until the end of the year would mean a closing-level > 3,000 points as per December-end 2018. ...been exceptionally bullish for the S&P 500 over the last 10 years. 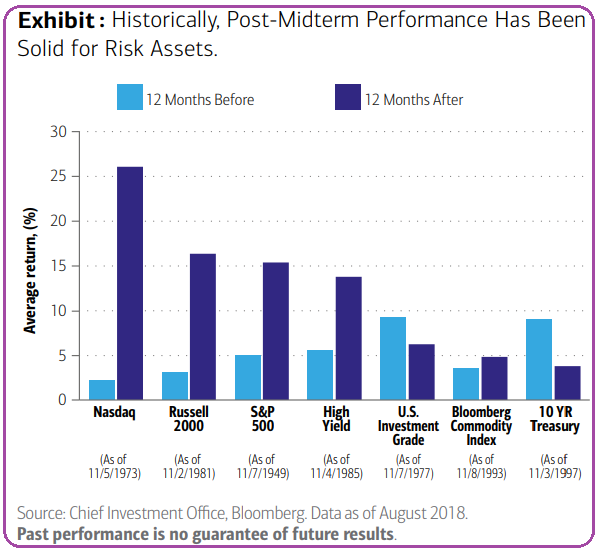 Over the next month (September), the S&P 500 has posted a median gain of 3.31%, which gets a 'perfect' rating when looking at all one-month periods of the year," said Justin Walters, co-founder of Bespoke, in a report. ...liegt bei minus 2,9 %. 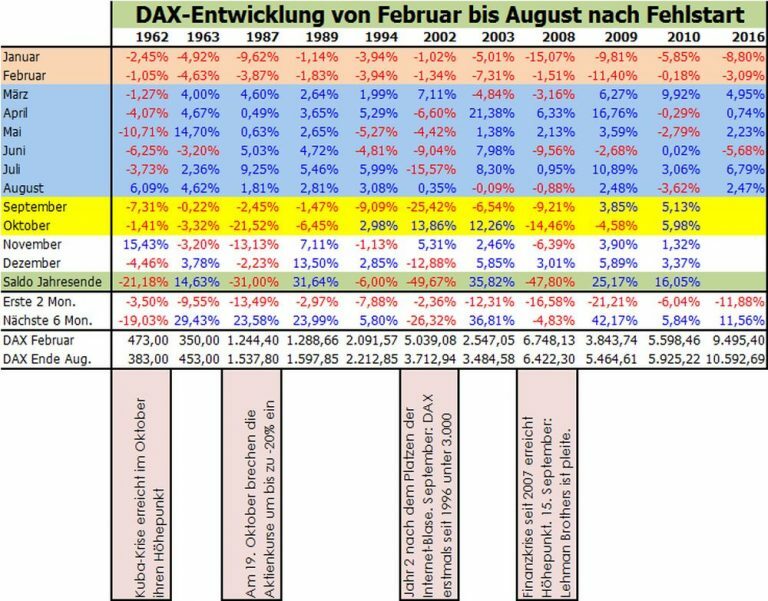 Stärkere Gewinne sind eher selten: 2012 legte der DAX um gut zwei Prozent zu. 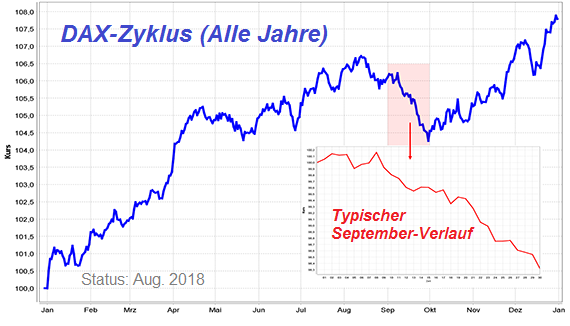 Auch in der längerfristigen Historie entwickelte sich der DAX im Spätsommer meist enttäuschend, wie die Auswertung verdeutlicht. 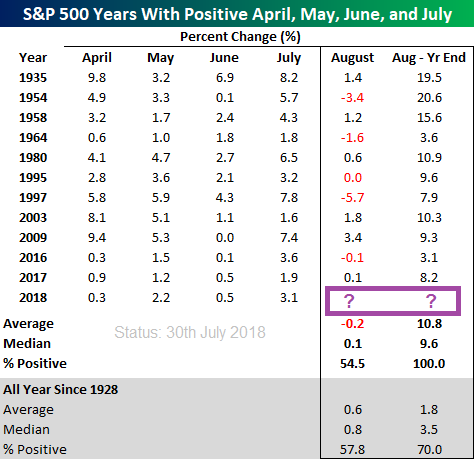 According to analysts at Bespoke Investment Group, if the market gains from April through July, stocks almost always finish out the year higher and despite Monday's weakness, it's looking good for the S&P 500 (today). "[...] this will mark the fourth straight monthly gain for the S&P 500," said Paul Hickey, cofounder of Bespoke, in a note. Since 1928, there have been 12 years in which the market has risen from April to July and every time, stocks have finished higher at the end of the year, according to Bespoke. 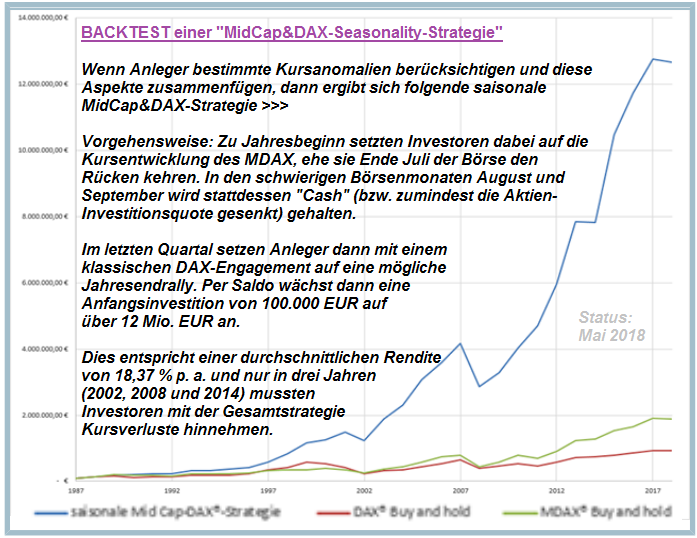 ...Jahresbeginn setzten Investoren dabei auf die Kursentwicklung des MDAX, ehe sie Ende Juli der Börse den Rücken kehren. ...kein Kursgewinn zu verzeichnen. Aber es gibt natürlich auch dazwischen Bewegungen. Schwach war der Markt z.B. vom 6. bis 21. Mai und von Ende Juli bis 30. September, dazwischen befand sich oft eine Aufwärtsbewegung. 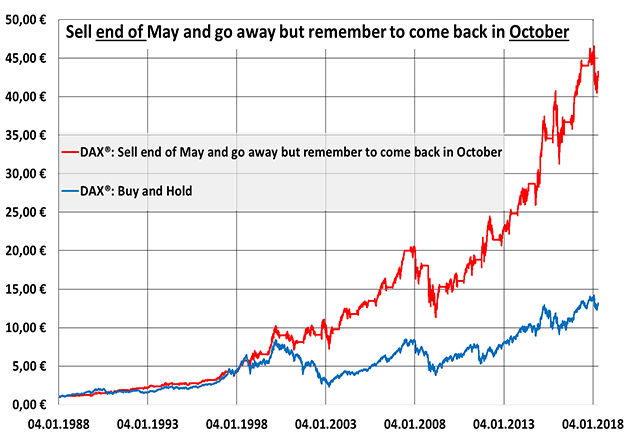 Man kennt sicher das bekannte "sell in May and go away". ...(nur) EIN! 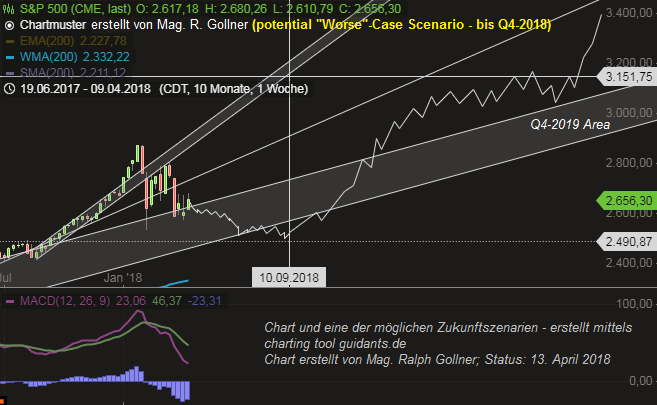 mögliches "Worse Case-Scenario" im S&P 500 (möglicher Chartverlauf im Jahr 2018, danach 2019). ..."his broader" brother: the US-Stock Market Index S&P 500 (based on the historical 20-year range / Timeframe). 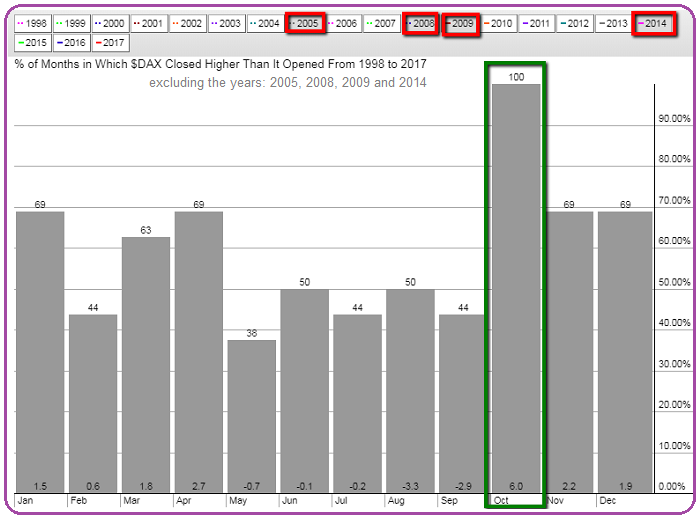 Hint/The site: equityclock.com always had some nice "Seasonality-Charts", which i often rechecked during the last years. 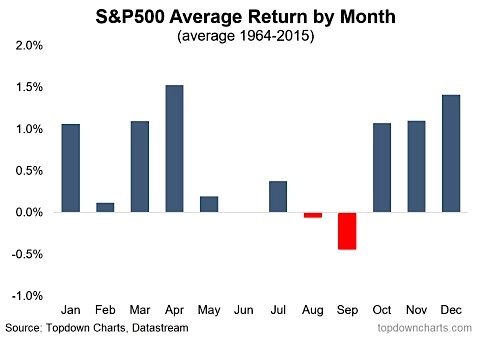 How important is January to the stock market? ...the Dow Jones Industrial Average and found that the first trading day has predicted the year's direction ca. 60 % of the time since the year 1901. Kensho is back and helping us out ! ... dieser Anlagestrategie bis 1970 zeigt, dass damit im Durchschnit eine Rendite von mehr als 10% pro Jahr erzielt werden konnte. 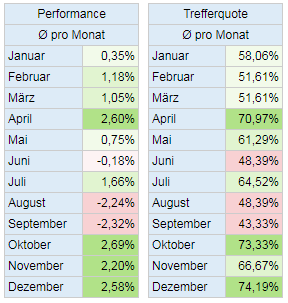 Der Benchmarkindex DAX kam im gleichen Zeitraum auf "nur" etwas mehr als 6% Rendite pro Jahr. 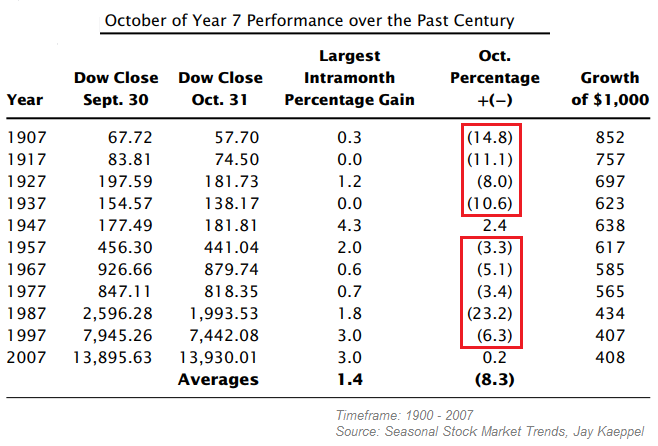 "Octobers of years ending in 7"
...the results for the Dow in Octobers of years ending in 7 have been pretty dismal. Don't be fearful, but stay cautious ! With the exception of 1927, it has literally been all downhill. 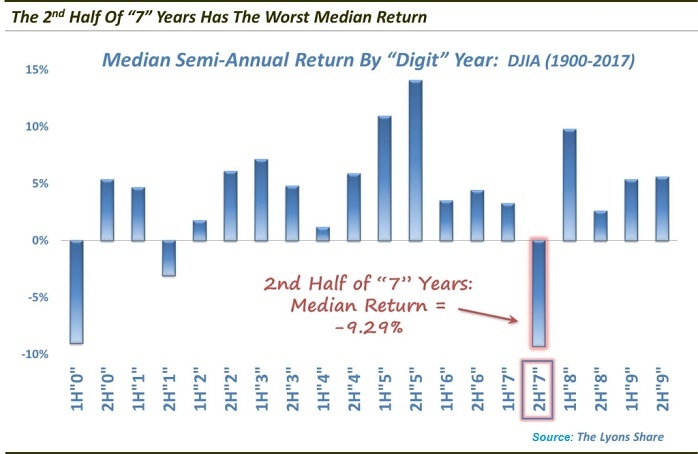 In fact, "7" years have the worst July-December returns, reporting a median return of negative 9.29% (see diagram above). Der DAX, der DOW, aber auch Einzel-Aktien unterliegen häufig saisonalen Schwankungen. Es ist höchst interessant und lukrativ zu wissen, welche Monate für welche Aktie eher bessere Einstiegsmonate sind und welche man vielleicht meiden sollte. The Trading Calendar presents full-year and monthly cumulative performance profiles for the overall stock market (S&P 500 Index) based on its average daily behavior since 1950. 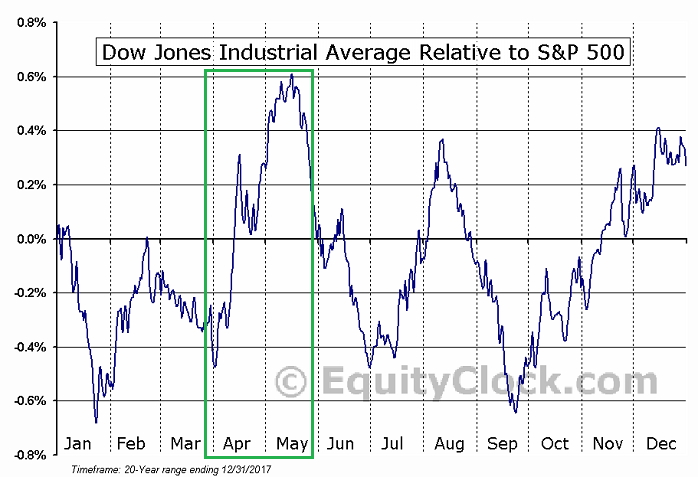 This bullish stock signal has never been wrong - and the Signal is green since 1st March 2017! CFRA's Sam Stovall notes one interesting indicator got triggered by the last trading day of Feb. 2017. ...your best chance over the next four - and maybe eight - years. 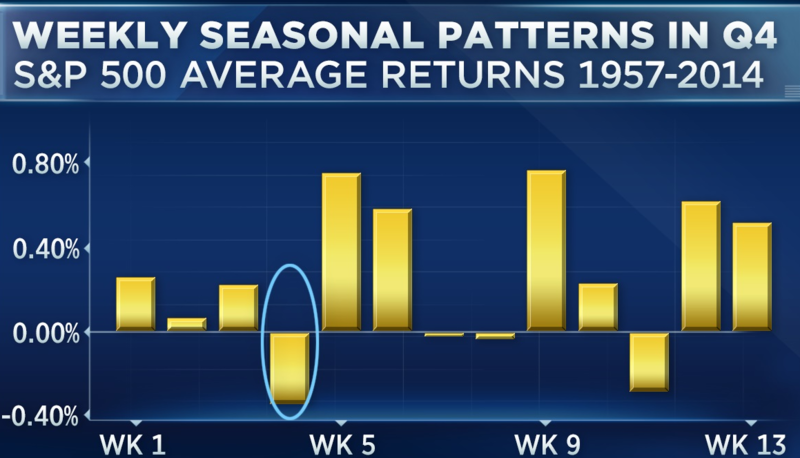 Using data going back to the creation of the S&P 500 in 1957, technical analyst John Kosar of Asbury Research found that "the fourth week of October, which is coming up soon, is seasonally the weakest of the entire fourth quarter." 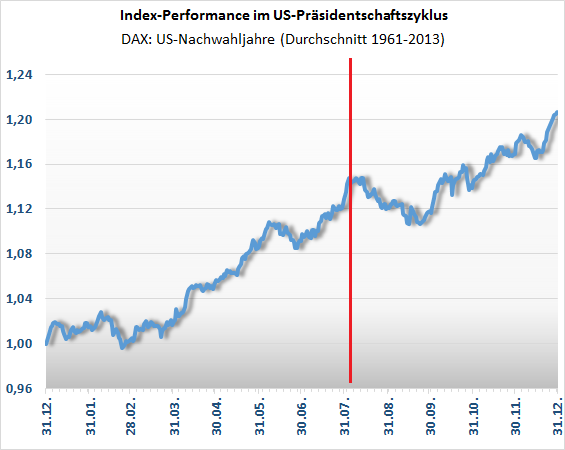 ...Performance-DAX seit dem Jahrgang 1960 aus. Falls man nun einwenden will, dass der deutsche Leitindex erst zum 1. Juli 1988 eingeführt wurde, dann hat man absolut Recht: Für die Zeit davor nutzt Herr Sommer zurückgerechnete Daten. If you want to get a feel for how the US presidential election will play out, then Byron Wien, Blackstone's vice chairman, has a suggestion: Look at stocks. Reminder: On the 8th Aug. 2016 the S&P 500 stood @ ca. 2,180 points. Since the 1920s, the incumbent party usually wins when market returns are high. But Wien cautioned that it doesn't work out perfectly, as shown in the blips in 1956, 1968, and 1980. 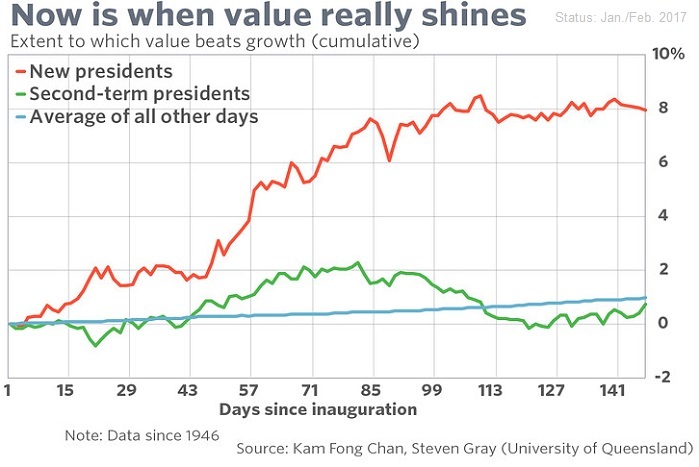 Does this year -being a presidential election year- provide reason to bet that the "sell-in-May-and-go-away" pattern will be any less pronounced than in other years. Maybe a historical wrap-up will help solving this question? The average gain and the frequency of success is the strongest of the year. That being said, one must wonder that given the stellar return recorded in March 2016, will results for April be altered as stocks become exhausted. Since 1950, there have been 6 instances where March has recorded a gain greater than 5%. And, without such precision, it is somehow pointless. 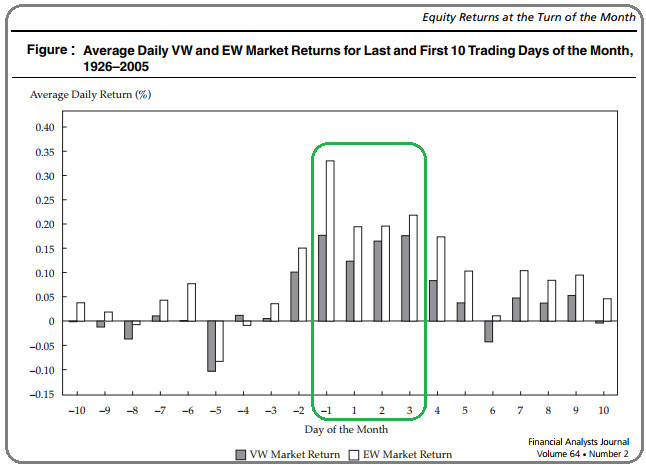 (BUT) after all, the stock market rallies during every month of the year. 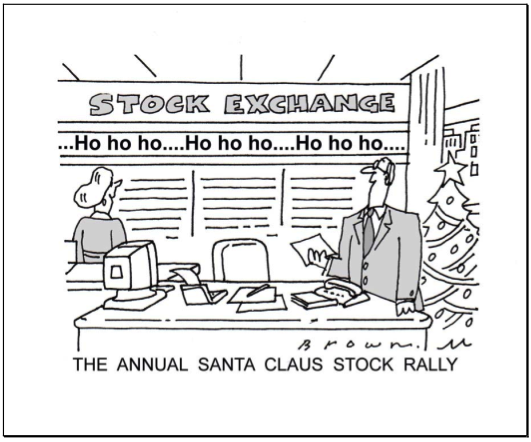 One could just as easily talk about an Easter Bunny Rally — or talk about a Santa Claus Decline, since the stock market inevitably falls at some point near the end of the year. 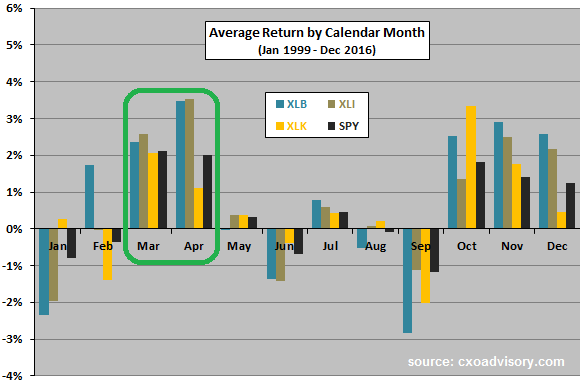 As one can see from the chart above, December’s average return is higher than that of many other months. 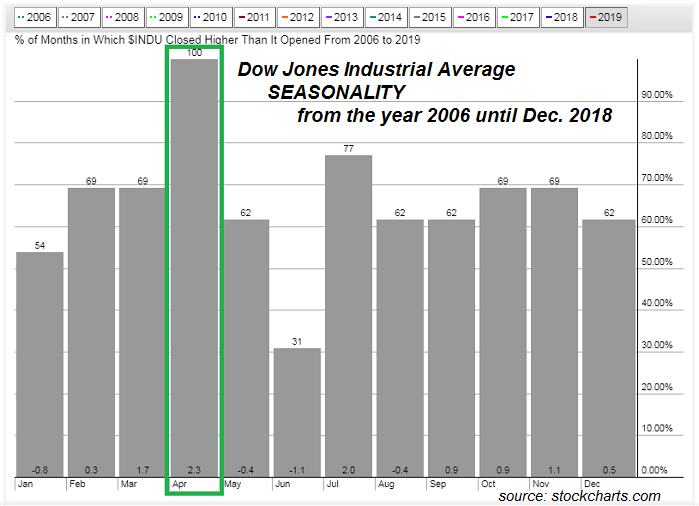 Since 1896, when the Dow Jones Industrial Average was created, for example, the Dow has gained an average of 1.4% in December, in contrast to an average of 0.6% across all months. Next week (starting 23rd Nov. 2015) is Thanksgiving in the US and investors should know about the equity market tendencies during this period. With less activity surrounding the Thanksgiving holiday on Thursday, stocks have a tendency of climbing. 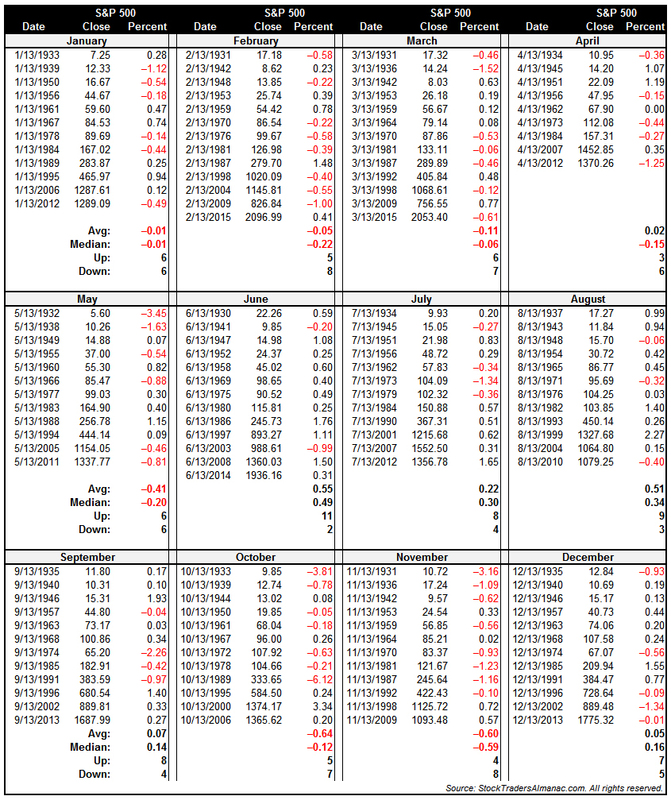 For the week itself, the S&P 500 index has gained 67.7% of the time since 1950, averaging a gain of 0.72%. The bulk of those gains come during the two days that bookend the holiday Thursday. Die Jahresendrally findet seit Jahrzehnten satt. Hier soll es nun nicht nur um die Jahresendrally von Oktober bis Jahresende gehen, sondern um den 6-Monatszeitraum von Oktober/November bis März/April. Diesem Halbjahr wird nachgesagt, dass es das beste des Jahres ist. Wer in diesen 6 Monaten investiert ist, kann im Prinzip von Mai bis Oktober Urlaub machen. 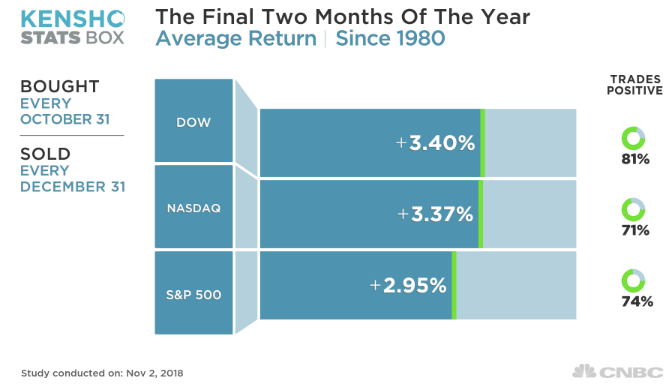 Since the 31st Dec. 1945 the S&P 500 rallied in over 77% of the time in the final two months of the year to reach an average gain of 3% in that short period. These odds are pretty good i may say. 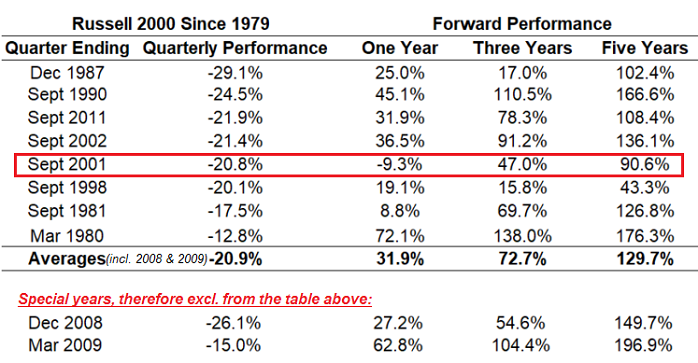 To put this into perspective: If you were to invest every year in a 10year-period, you would gain in 7 years out of 10 (and in 3 years you may lose, if you only pick the index; If you are a good stock-picker you may be able to avoid a possible fall in the index/versus an ETF-Holder). 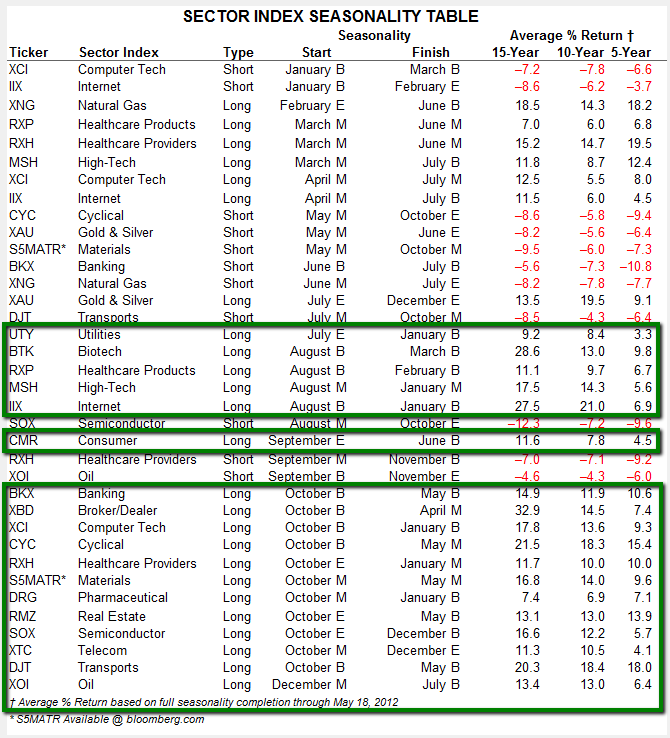 Following the history of seasonalities up to May 2012 (15yrs-history) each market-sector has its "season" to stay LONG (buy & hold stocks) or short ( = "better reduce ones exposure in equities of these sectors during that period"). 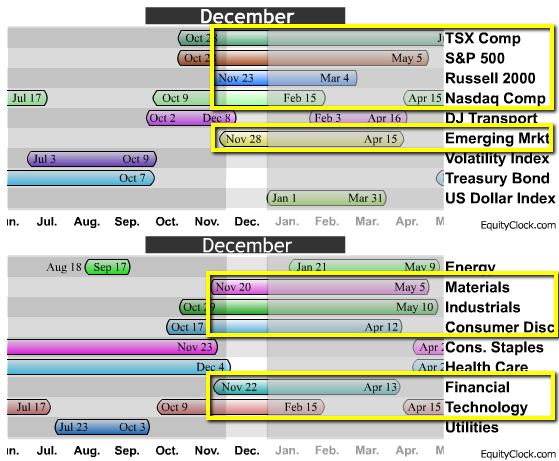 The best six months for stocks is ? 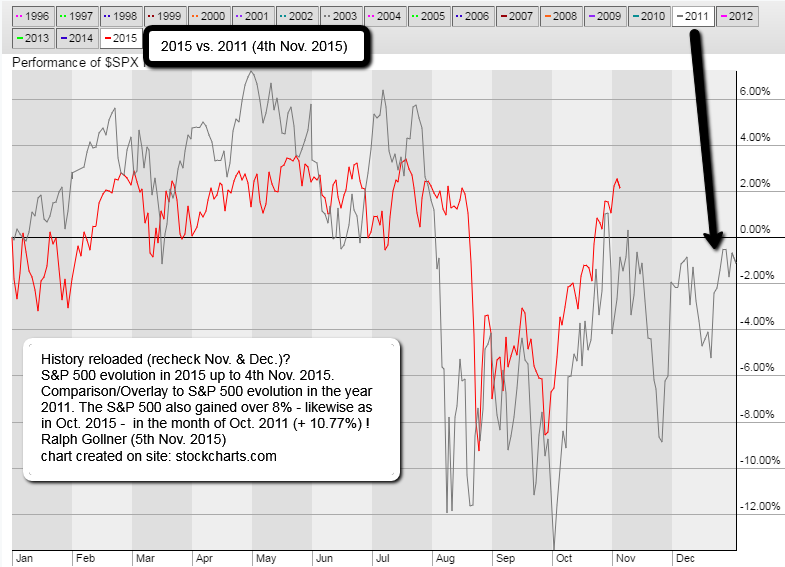 Odds are that the Halloween Indicator may be especially good for the stock market this year. But before starting this article (source: marketwatch.com), take a look at the history in the S&P 500 period: 1950 up to the year 2010. 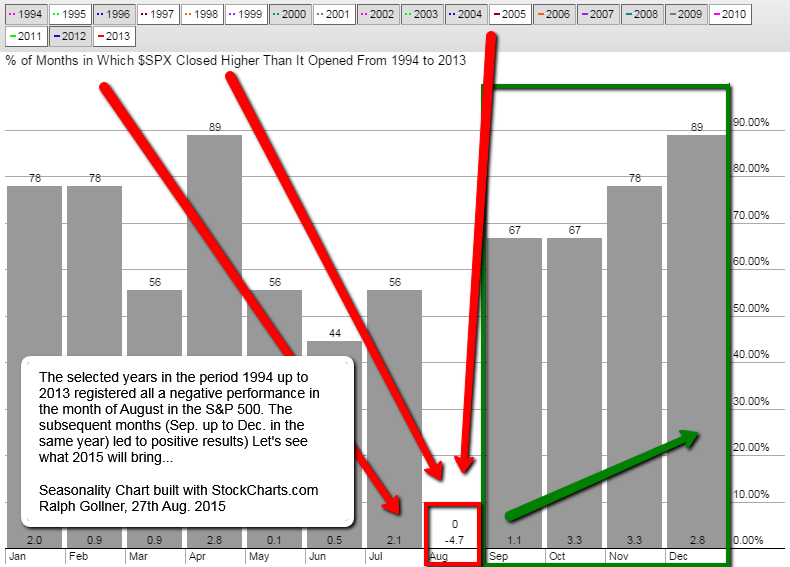 What follows a negative performance in the month of August in the S&P 500? The S&P 500, together with the global financial markets being in turmoil for around one week already (staus as per 27th Aug. 2015 after market close) may end the month of August with a negative performance. As the crucial months of September and October are upcoming one can also recheck the historical development of the remainder of the year following such a monthly drop in August as can be seen in the chart above. In 2012, Ben Jacobsen and Cherry Y. Zhang from Massey University (New Zealand) wrote very interesting articles. Compiling available data since 1693 in 108 countries, they claim that not only the discrepancy between Summer and Winter is as old as stock data, but that it can be observed worldwide and has increased in the last decades. 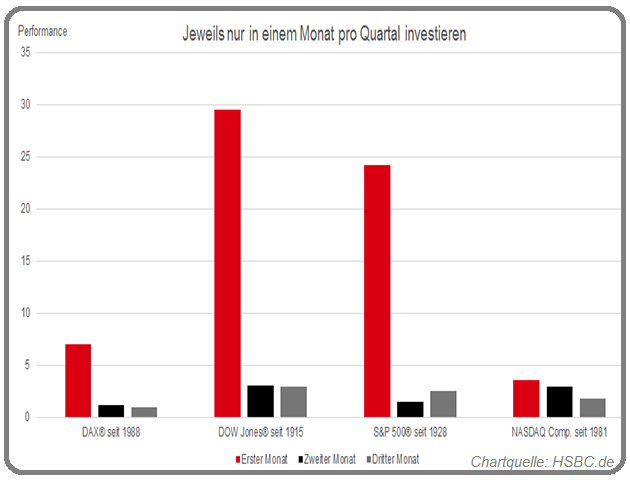 In den letzten 20 Jahren gab es in 16 Jahren einen positiven Oktober für den deutschen Aktienmarkt (DAX). 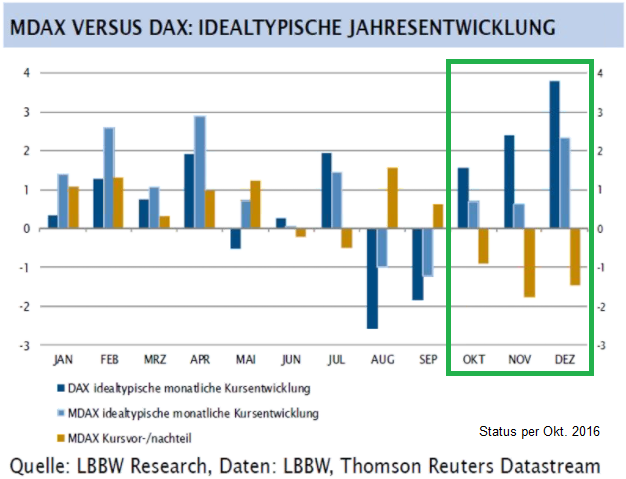 Schauen wir mal, was der Oktober 2018 so bereit hält..
"Neuer Leitspruch für DAXSeasonality Fans"
A reason to be scared is exactly what stock-market investors don't need right now. 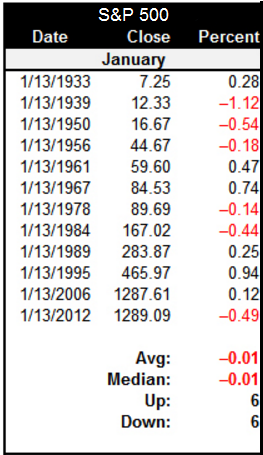 It is Friday the 13th...In the following table you see the historical stock-market performance on Fridays if they fall on the 13th of a January. No need to hide! History does repeat itself, it rhymes more than expected...(at least 2015 versus 2011). In hindsight (Spoiler: Bias) the evolution looks reasonable in the light of the first FED-rate-hike after several years in Dec. 2015! 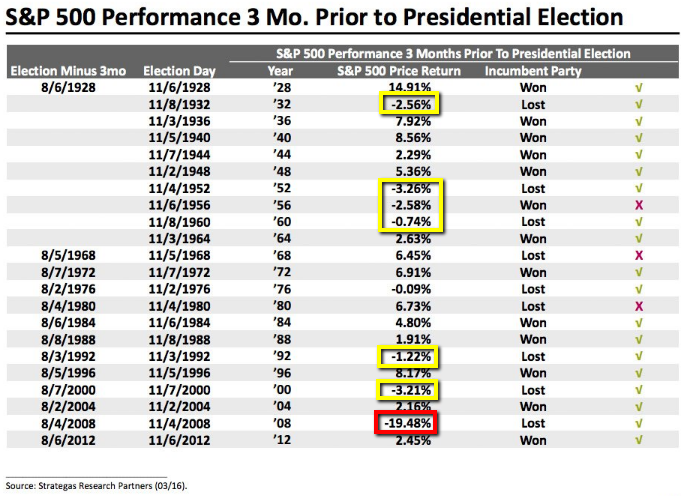 In presidential election years, the S&P 500 has posted an average return of 6.5% versus 7.9% in all years. Excluding 2008, presidential election years going back to 1960 have seen an average return of 9.1% versus 8.8% for all years. 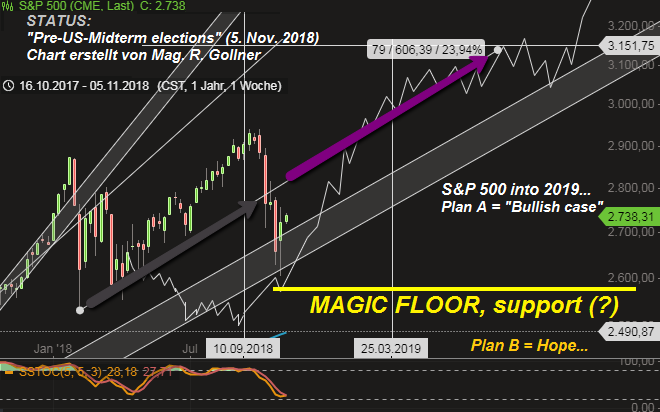 S&P 500 possibility for Year-End-Rally? While short-term interest rates are set by the Federal Reserve, longer-term rates are determined by the market. A rise in longer-term yields is generally an indication of an improving economy. 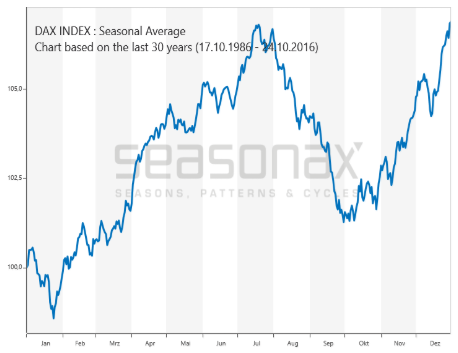 In the section 4-Year Election Cycles SeasonalCharts.com examined a four-year instead of the typical one-year cycle. The chart shows the average course of prices over a total four-year period.